What's the deal with a badge? • DefCon is a hacker convention that happens every year in Las Vegas. The convention has gotten to be pretty big and has a few subconventions going on at the same time. This is the chance for hackers to show off what fun things they can do. Many of the subconventions have their own badges, and most of them are interactive in some way, including puzzles and games, or codes you need to break to unlock what the badge can do. I got a chance to help develop one of the badges this year for one of the subconventions, Queercon. This was a really fun project -- unusual requests and results and a great team to work with. The badge itself • The badge team consisted of hardware engineers, software engineers, project managers, and a designer (me). The theme was mostly set by the time I was added to the project. The team liked the idea of paying homage to Portal 2's companion cube. They also very much wanted to emphasize community during the convention, so they's come up with a game that required people to work with each other to access new levels of icons on their badges. For the badge, I helped with badge form factor design, silkscreened graphics, and icon development and animation. The final badge had a 7 x 7 LED screen, so it was quite a challenge to get cohesive icon concepts squeezed into the tiny bulbs. Icons were delivered as a 7x7 Photoshop file with layers as animation frames. Image courtesy of Evan Mackay, published under Creative Commons 4.0 licensing. Badges were white or black. White was the general admission badge and the black were the special staff/guest badges. Image courtesy of Evan Mackay, published under Creative Commons 4.0 licensing. The game • Badge holders started out with four element icons. They'd need to physically dock at least one badge to another to combine the elements into a new element. Both badge holders would then have a brand new icon and need to meet someone new to try to level up to the next icon. Additionally, some icons could be discovered by freezing the badge or exposing it to light. The badge had some wireless capabilities so each badge could report what icons had been unlocked, allowing a large reader board in the Queercon suite to display discovered icons. The final icon map shows all the discovered icons. Image courtesy of Evan Mackay, published under Creative Commons 4.0 licensing. Collateral • The Queercon team rented a suite that served to host parties and mixers as well as a space for people to get away from the onslaught of Las Vegas stimulus and relax a bit. To brand this popup sanctuary and party, we designed various collateral: signs for directions and rules, floor vinyl, programs, beach balls for the pool party. Also needed were t-shirts to help fundraise. All of this started with a theme and a logo. 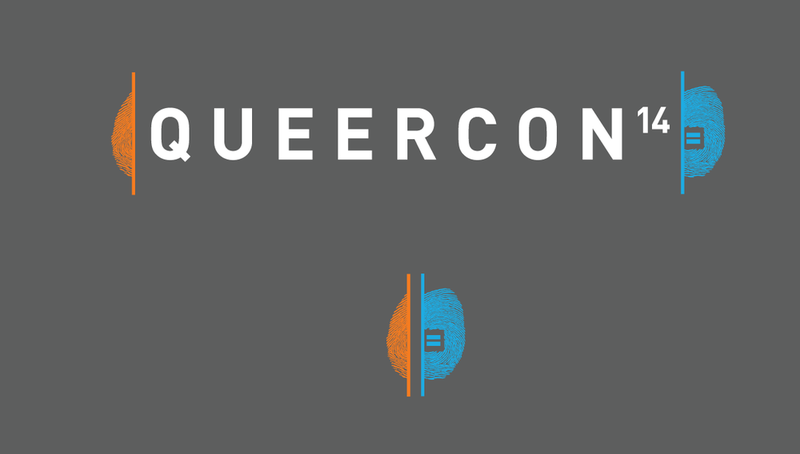 Queercon's logo included a big nod to Portal 2. Fun part about the floor vinyl: we had schematics for the suite but no measurements so we used the outlines for the toilet on the map to figure out sizing. One of the final floor vinyls in the suite at Caesar's Palace. This was the best part: people using the badge and working hard to figure out which icon led to which.